I’m calling this a new experience, because it was my first work field trip at the new job and I was doing different tasks than I have done in previous jobs. And, I went to places in Colorado that I have not been! We’ve set our first rural teacher recruiting event for next month in Huerfano School District, which is headquartered (and mostly located) in Walsenburg, Colorado. For those who don’t live here, Walsenburg sits at the crossing of I-25 and U.S. Route 160, which runs across southern Colorado to Alamosa, Wolf Creek Pass, and Durango. I have been through Walsenburg, but haven’t really stopped, except perhaps for fuel or a bathroom. Wednesday was our first on-site planning meeting. My colleague and I arranged to meet some of our grant partners in the K-8 Gardner School as they were finishing their morning activities. We got a tour of the school, which is built sort of in layers around the original building. The classrooms are spacious considering the current school population, as numbers are down from peak enrollment. 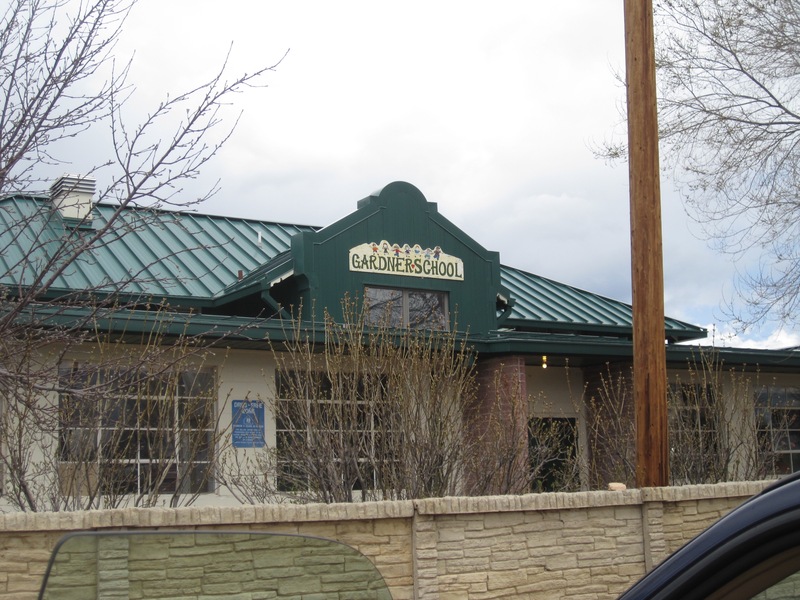 The Gardner School really belongs to the community. When there was talk of busing the 7th and 8th graders into Walsenburg–25 miles away–the community came together and literally built an addition to the school for them. They have also built gardens and a greenhouse and regularly participate in school functions. Most recently, the community spoke out when the school was in danger of shuttering. Gardner has a bit of an interesting history. Europeans have had settlements in the area since at least the 1850s. In the late 1960s, a commune called Libre was established nearby. Parts of it still exist, and I have to admit I am intrigued to learn more about what it was like during that time (I may need to read this book). There now exists an annual Hippie Days in Gardner–stop by and visit us on the way if you decide to attend! In any case, the commune also increased the school’s enrollment. We lunched at Wildflower Cafe in Gardner. Most of us had the Cinderella salad, which came with a great variety of toppings and a perfect amount of dressing. The rest of the day was spent in Walsenburg, at Peakview K-8 and John Mall High School. We accomplished a lot during our meetings with local school administrators. After our meetings, we stopped by to visit Karen Wilson at the La Plaza Inn. Karen, who is very active in the community, has graciously agreed to help us connect with local professionals, and we are looking forward to lodging with her as well. We hear only good things about her inn and restaurant (with a chef!) from our colleagues! By the way, if you know anyone who might want to be a teacher in Walsenburg, send them my way!